Definition at line 25 of file AccessRule.h. Definition at line 38 of file AccessRule.h. Definition at line 20 of file AccessRule.cc. Definition at line 24 of file AccessRule.cc. Definition at line 36 of file AccessRule.cc. References Adaptation::AllGroups(), DBG_CRITICAL, debugs, Adaptation::FindService(), group(), groupId, HERE(), and NULL. Definition at line 55 of file AccessRule.cc. Definition at line 30 of file AccessRule.cc. Definition at line 41 of file AccessRule.h. 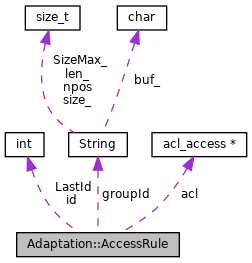 Referenced by parse(), and ~AccessRule(). Definition at line 40 of file AccessRule.h. Referenced by finalize(), group(), Adaptation::AccessCheck::isCandidate(), and Adaptation::Config::removeRule(). Definition at line 39 of file AccessRule.h. Referenced by Adaptation::AccessCheck::check(), and Adaptation::AccessCheck::isCandidate(). Definition at line 44 of file AccessRule.h.